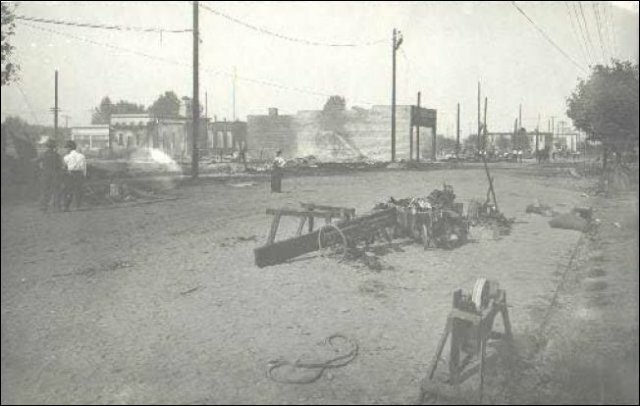 This photo shows the aftermath of the July 24, 1911, downtown fire in old Woolley. It was taken from the roof of the Wixson Hotel, now the Gateway, which was constructed just 15 months before that. The unnamed photographer took the photo as young boys dipped gunnysacks in water barrels and swatted out the burning cinders all around. The Wixson had replaced the Osterman House, a woodframe hotel, which burned to the ground in September 1909. In the foreground is Ferry street. Metcalf street is at the center, the heart of the fire, where all the buildings in the 700 block have been burned to the ground or completely gutted. The Bingham Bank stands unscathed at the rear of the photo. It had been gutted by fire in January 1909. 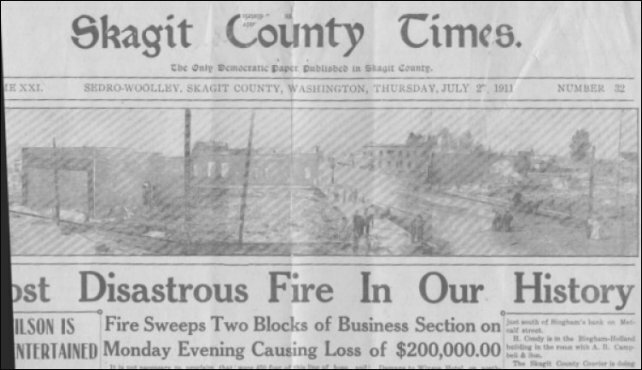 The photo is a reproduction of the July 27, 1911, Skagit County Times newspaper, which was housed on State street at the corner of Third street (where the Mission Market/Diamond Building stands today), three blocks away from the fire. We are making a proposal to the 2011 Loggerodeo Committee that they consider making suggestions to parade entries that they incorporate the theme of the 1911 fire for their floats and decorations this year for the centennial. We have met with the mayor and fire chief to plan how the fire department can be involved with observing the centennial. This event is one of the most important legacies in that it led to Sedro-Woolley's unique all-brick downtown business district. The famous 1911 fire of downtown Woolley. Have you ever wondered why downtown buildings are made of brick? Photos of Fritsch Bros. hardware, where the fire started; a view of the fire's aftermath, looking southeast; a view of the fire's aftermath from Ferry street, looking west/southwest. 4th of July parade and view of Metcalf just days before the fire. Do you have photos, documents or family memories to share that you can scan or copy for us? Please use the email or log into our guestbook below. By Noel V. Bourasaw, Editor, Skagit River Journal, ©2001 The most famous fire of Sedro-Woolley history, on July 24, 1911, was a bit of a Keystone Kops affair. Amazingly it started directly across the street from the city fire department, which was quite advanced for its time. Unfortunately the first victim was the department's own hose. The fire was confined to just two blocks but they were the two most densely occupied blocks in the center of what was originally the downtown Woolley business district. By the time it died out only four buildings were standing in the area bounded by Eastern avenue to the west (railroad tracks), Ferry street to the north, Murdock to the east and Woodworth street to the south. When it was all over, late that Monday night, 25 businesses had sustained $200,000 of damage, a fortune in those pre-World War I days. Only four buildings had survived. Those included the Vendome Hotel at the southeast corner of Ferry and Eastern (where the BP station now stands), and the home of a Mrs. Ross at the northeast corner of Woodworth and Eastern (former mayor Spud Walley apparently lived in that house once as a boy). Those structures survived because a warm southwest breeze fanned the flames away to the northeast. This view of the 700 block of Metcalf street is from about where the post office is today. You are looking northeast. You can see the new Wixson hotel in the background. To the left is the firewall of the Fritsch Hardware building. Today, that is between the pizza parlor and the chamber of commerce office. Across the street is the shell of the Condy Jeweler building, which survived the fire. It is today part of the Cascadian Farm complex. Far left: Here is where it all started. The Fritsch Bros. Hardware store, at the northwest corner of Metcalf and Woodworth streets, where the florist shop now stands. At the far left, just out of the photo, was the oil shed on the alley where a barrel caught fire and the fire began that morning. This photo was taken sometime in the 1890s. 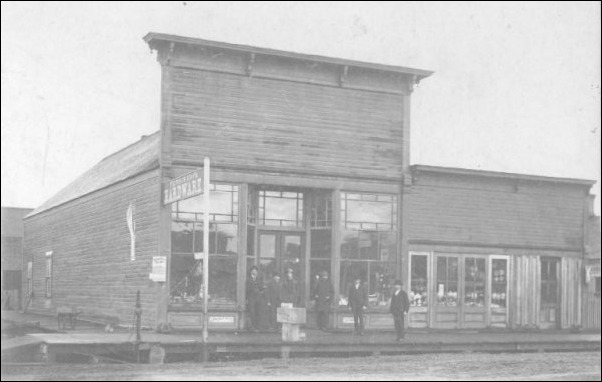 In January 1893, brothers Joe Fritsch and Frank Fritsch Jr. bought the store of Herman Waltz, who was the hardware man in old Sedro and apparently moved up to P.A. Woolley's company town sometime in the very early 1890s. We know that the brothers erected a new building in 1897, which could be the one in the photo. The Fritsch family, headed by Frank Sr., moved to the Sauk river from Texas in the mid-1880s after originally immigrating from Germany. Frank Sr. was a longtime businessman in Burlington..
Center: This view is southeast from about where the service station is by the railroad tracks on Ferry. The photographer was probably standing just outside the Vendome hotel, which stood at that location and was spared from the fire. It was built in the mid-1890s as the Royal Hotel by Charles Villeneuve Sr., whose son, Charles Jr., would become famous as the marshal during the famous 1914 bank robbery in Woolley. It was sold in September 1903 to Frank Bergeron, a hotel- and saloon-owner from Clear Lake, who renamed it. Right: This photo looks west on Ferry street and shows debris as well as equipment, with hulks of buildings in the background. At the rear left, you can see the back of the Condy building, which survived because of its firewalls and still stands today with the Condy clock in front of it. The door on the alley leads to the backroom where the Skagit County Courier newspaper was launched in 1901 and was still there when the fire occurred. In the rear center, you can see the firewall of the Herron building, which was about where attorney Bill McCann's office is today, across from the Gateway. At the rear right, you can just barely see the Vendome Hotel, which survived the fire because the wind was blowing from a southwesterly direction. Source of the fire The fire apparently started in a burn barrel either in the alley or in the oil-storage shed behind the Fritsch Bros. Hardware store, which fronted on Metcalf at the corner of Woodworth. The account from the Skagit County Times is unclear but apparently the flames spread into the woodframe store sometime after the close of business that evening. Actually the Fritsch brothers had foreseen the possibility of fire and constructed a brick firewall that separated their store from Theodore Bergman's Star Grocery to the north. The city firehall was just 75 feet across Woodworth street to the south and there was a fairly new hydrant at the corner nearest the Fritsch store. Had the water not failed, this fire wall could have slowed down the fire and the damage could have been confined to those two buildings. The fault was not in the mains themselves; as the Times reported, the pressure was splendid. Instead, in the rush to extend hose to Metcalf street, the volunteer firemen made a mistake and laid the initial section of 450 feet of hose alongside the Fritsch building, which was fully engulfed in flame that time. In addition, the hose doubled back and pressure built up in the loop, which retarded the flow of water. The hose began to leak and a man had to be wrapped in wet blankets in order for him to detach this hose line from the hydrant. The heat was so intense that he was only partially successful and from then on the water pressure was considerably weakened. By then the fire had leaped east across Metcalf to Mr. Levy's Red Front store (now Cascadian Farm), and north across the alley from the Star Grocery to the Vienna Bakery (now the Castle Tavern) and Union Mercantile Department store, owned by George Green, F.A. Hegg and Emerson Hammer, which was located in a woodframe building at the southwest corner of Ferry and Metcalf. 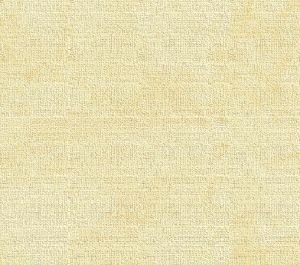 This Journal website about the Castle shows how that block was nearly leveled by the fire. From there the two tongues of flame leapt east and north to the woodframe Donnelly block (most recently Don Ostrom's Cost Less Sporting Goods) and the two blocks were totally engulfed. 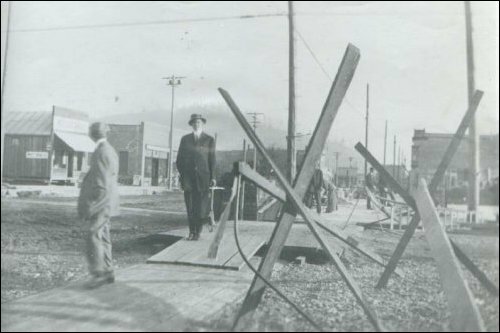 The heat was so intense that $2,000 of damage was sustained at the Gateway Hotel across Ferry Street (opened as the Wixson Hotel and Bank the year before after the original Osterman House hotel burned in September 1909). The hotel was saved from further damage when youngsters from town were sent up to the roof with blankets and gunny sacks, which they soaked in water and used to smother coals and flames that were blown across the street. Because the fire mainly blew north, the residences of James Gray (owner of the Palace Tavern) and Ewestern Reno (owner of the old bicycle shop on Woodworth street) were saved from major damage. Gray's house was located where the health clinic now stands across from the American Legion club. And Reno's house stood just west of where the 1930 city hall was built. 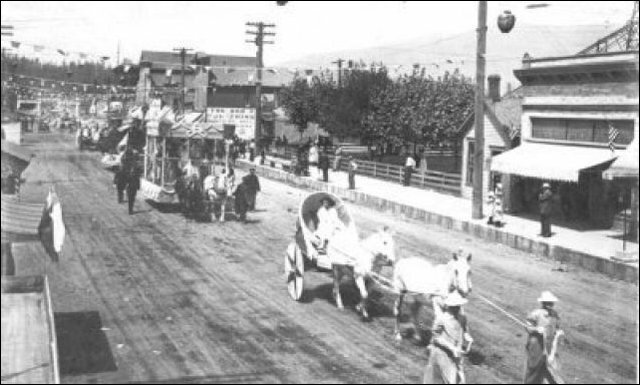 This parade was on Metcalf street on the 4th of July, 1911, just days before the fire. You can see telegraph and telephone poles at the left as you look north. The streets were apparently graveled at this point. In the center back, you can see the Donnelly building, a large woodframe structure that originally housed Donnelly's meat company, which supplied two dozen mills and logging camps in the area, and Dale Tresner's harness shop. Center is the Red Front furniture store, which stood where Cascadian Farm is today at Woodworth and Metcalf streets. At the right is the orchard that stood in front of P.A. Woolley's mansion. At the far right, in the 800 block of Metcalf, is the original Skagit Realty in a small house, and a millinery shop to the south of it. Woolley rebuilt of brick The most obvious legacy from the fire is our brick storefronts downtown. Several insurance carriers demanded that the former woodframe buildings be replaced with brick structures and firewalls be erected between them. All but four of the ravaged buildings were originally built partly or completely of wood. Woolley's economy was booming at the time of the fire and by the next day many of the business owners had already opened for business in tents as the coals from the fire still smoldered. Over the next weeks, wooden temporary quarters were moved into place on log rollers. Bergman was not to be denied. He moved his Star grocery across the street to the old Red Front site and a new building was soon constructed. It later became famous as the original Coast to Coast store, managed by the legendary Shorty Pfannanstiel. And by 1913 most of the downtown buildings we now see were erected to erase the scars of the fire. Woolley was visited by several disastrous fires in the early part of its career, one of the first being May 26, 1891, and resulting in the total destruction of the Hotel Alexandria, at a loss of about $2,500, the insurance being $1,400. 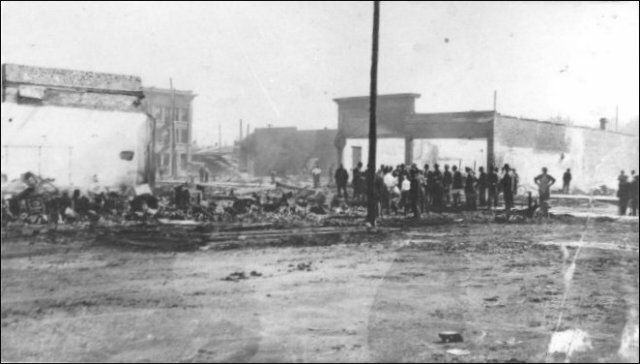 On April 26, 1893, a far more serious fire occurred in which nearly the whole of the business part of the town was consumed, entailing a loss of nearly $20,000, only partially covered by insurance. The fire started in some mysterious manner in the saloon of Joseph Matthews. The heaviest losers were Austin & Ruel, hotel building and contents, loss $5,000, insurance $1,300; Davison & Millett [mill owners], loss $4,000, being the buildings occupied by J.W. Peake, Central meat market, Chamberlain Brothers and William Doherty, insurance $2,800; F.A. Douglass, drug store and stock, loss $3,500, insurance $1,000; Ford & Hosch, saloon $2,500, insurance $1,500; J.C. Ames, barber shop, loss $250; Ben Willard, restaurant, $250, and many others, who suffered in a less degree. The Bingham-Holland building in downtown Woolley was gutted by a fire on Jan. 10, 1909, and sustained $30,000 in damage, but the shell was soon rebuilt. The building still stands today and was remodeled over the past five years; it now houses a Dollar Store. The Schneider block, the site that housed the bowling alley until it closed in the 1990s, was a woodframe building at the time of the fire. It burned on Jan. 4, 1914, and was replaced by a brick building that housed Schneider's general store and other retail, then the Eagles Hall and finally the bowling alley, starting in 1946. 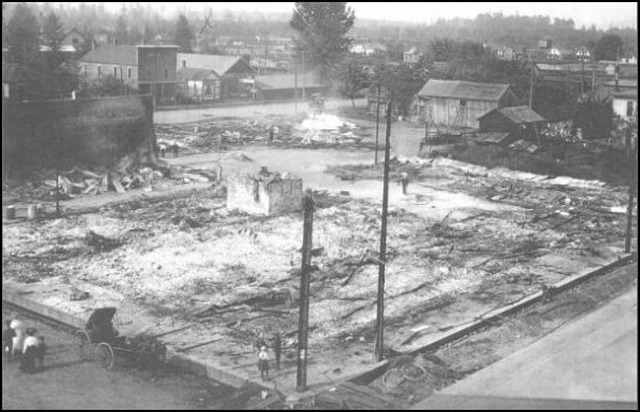 The 1911 conflagration was the last major fire until the Sedro Box and Veneer plant burned in December 1924, located just north of Cook's original Sedro townsite. The first volunteer fire brigade was organized in 1903 by fire Marshall Jasper Holman. It consisted mainly of horse-drawn water pumpers and man-drawn hose reels. In 1921 a volunteer fire department was organized under Chief William Ropes, who moved to Sedro-Woolley in 1907. Up until then, most fires were fought with the handcarts. Ropes has been a champion hose coupler in the Midwest and trained three local teams here that won the Washington championship. The first fire track, a Ford Model-T chassis rigged with hoses and ladders, was purchased by the city in 1922, and another followed in 1925. You can see one of the earliest trucks at the Sedro-Woolley museum. Ropes was chief for 30 years until his death in 1943. A small firehouse was part of the city hall that was built in 1930. An addition was extended west in the 1970s and was replaced two years by the new police and fire hall on Metcalf street. Sedro-Woolley's fire department has always been supplemented by volunteers and they were honored in 1996 on its 75th anniversary. 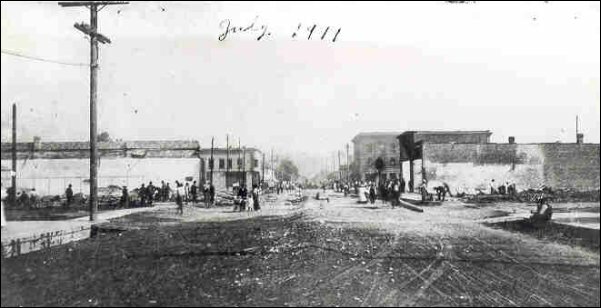 See the 1914 bank robbery story for more photos of what downtown Woolley looked like in those days. More views of downtown Woolley, post fire. 700 Block Metcalf, looking southwest, post fire. 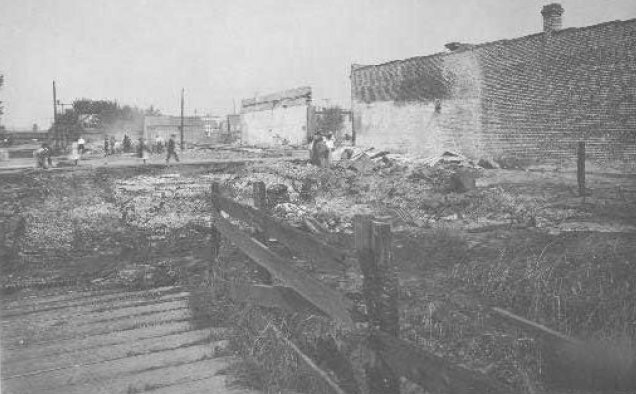 Metcalf street, looking south, post fire, probably a week or so later. at the left, you see a temporary building that was already rolled onto the site on log rollers within hours of the fire. The man in the derby hat may have been pioneer Paul Rhodius . Rebuilding old Woolley after the Great Fire of 1911. Block by block we review the businesses and construction that made Sedro-Woolley's unique brick downtown of today.